A leading winemaker plans to create one of the largest vineyards in England. Chapel Down in Tenterden, which has vineyards across Kent, outbid a French wine house to lease almost 400 acres of land near Boxley on the North Downs. Chief executive Frazer Thompson said: "Its chalky soil and beautiful slopes are just sensational land for growing grapes to make sparkling wine with." 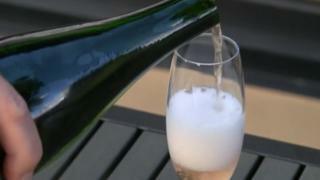 The new vineyard will have the potential to produce up to a million bottles of sparkling wine every year. Mr Thompson said: "We've been winning gold medals but if you can't get hold of it [wine], it's pretty frustrating, so we need to grow more of it. "It's a really exciting business. It can bring tourism, it can bring all sorts of other benefits with it too." He predicted that in time Kent could become "a really serious competitor" for the Napa Valley wine region in California.